When we last caught up with Belgian builder Gregory Coquelz (Yatkuu), Brother Chris was delivering the bad news that Gregory’s brilliant Shaun of the Dead Cuusoo project would not see production despite it’s overwhelming popularity. If you missed the posting the first time around it is definitely worth the read for a look at a the Cuusoo process. 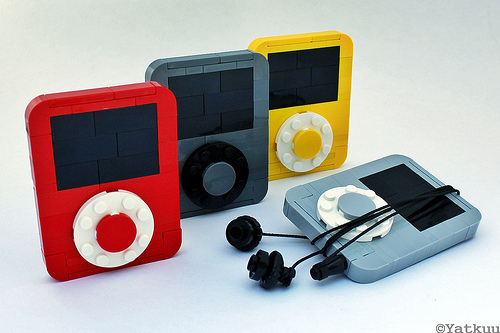 In the meantime, Mr. Coquelz has been busy building a great many things, including the “iPod Nano 3rd Gen.” you see here in a variety colors to suit your individual lifestyle. I have to admit that aside from the Winchester, I wasn’t all that familiar with Gregory’s work so I took a stroll through his back catalog and found this gem from 2011, based on the 2009 film The Road. 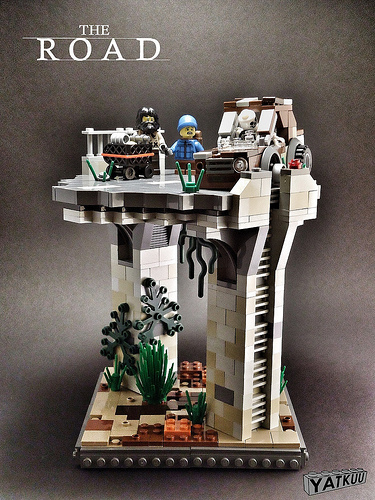 The minifigs are spot-on and so is the grocery cart. Gregory also has a model of the giant mechanical lemon the band U2 used on it’s 1997 PopMart Tour, for those of you who are into that sort of thing. Those ipods are great, but I daresay they’d be even better with the 4×4 round plate with 2×2 hole in the middle, so that the center button is recessed. They don’t come in white yet, but black at least is available.